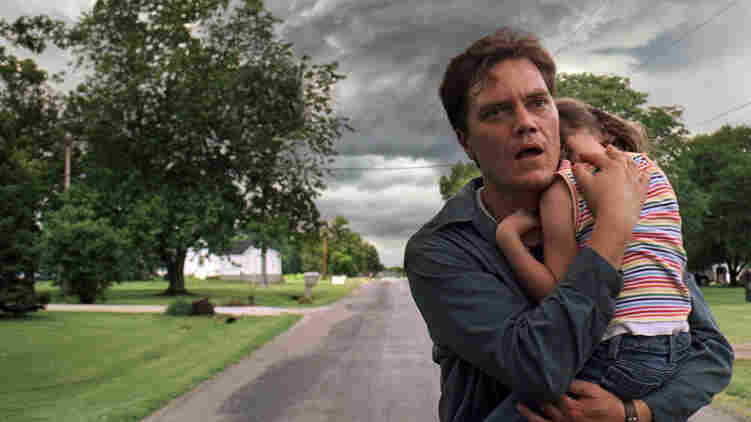 It's easy to giggle at the hero of Jeff Nichols' second feature, Take Shelter. Michael Shannon is Curtis, a crew chief for an Ohio sand-mining company who's ravaged by apocalyptic visions and nightmares. He's wiggy to start with and increasingly more unhinged, on a switchback track to madness that threatens to devastate his family. Curtis sees funnel clouds, locusts, even people staggering through the night like zombies. He knows it might all be in his head: His mother was diagnosed with schizophrenia at about the same age he is now. But in the end, he follows his dreams. He devotes his hours — and the family's little money — to enlarging the storm shelter in his backyard to prepare for whatever's coming. Curtis is losing it big time — yet his anxieties mirror things in the air right now, from fear of unemployment and tenuous medical coverage to ever more floods and hurricanes. It's a movie for an era in which the Book of Revelation has made a comeback. The danger in casting Shannon, with his haunted eyes and history playing demented characters in such films as Bug and Revolutionary Road, is that his latest unraveling might seem like déjà vu. But the actor is a truly anguished presence, and director Nichols makes sure what's eating Curtis is eating you, too. He breaks down scenes into images of destruction — not just obvious ones, like funnel clouds and spiderwebs of lightning across the Ohio fields, but chains and valves and shovels scoring the earth. In many scenes, Nichols and his cinematographer, Adam Stone, evoke the feeling of being inside a house staring out at a deluge — the kind of will-it-never-stop rain that makes even home sweet home seem like an emergency shelter. Take Shelter would seem as obvious as its title if the early scenes weren't so tenderly directed. Curtis' tireless wife, Samantha, who sells homemade crafts at flea markets, is played by Jessica Chastain, a vivid actress who made a huge impression in Jolene, and who does marvelous work in The Debt and even The Tree of Life, where's she playing a symbol. The couple have a deaf little girl, Hannah, played by Tova Stewart, who's in a lonely world of her own and has a quietly beseeching presence. When Curtis pens the family dog, Red, in the back after a bad dream and puts the money for his daughter's cochlear implant at risk by enlarging that shelter, Samantha finally turns on him. Jessica Chastain plays the protagonist's increasingly frustrated wife, who can't see — and can't comprehend — the visions that terrify her husband. "Explain that to me," she rages. "Please. Tell me something that helps me understand why you're being like this." "There's nothing to explain," he says. Take Shelter didn't come from nowhere. Jeff Nichols' doomsday view was on display in his 2007 movie, Shotgun Stories, which few people saw but I put on my 10-best list. That film, which also starred Shannon, took place in the South and centered on a tragic feud between two sets of half-brothers. It captured the connection between fatherlessness and the impulse to wreak vengeance like no American film I've seen.